Mr. Ratan Tata – Chairman Emeritus, Tata Group, Mr. N. Chandrasekaran – Chairman, Tata Sons and Tata Motors, Mr. Guenter Butschek – CEO and MD, Tata Motors, Mr. Pratap Bose – Vice President, Global Design, Tata Motors, Mr. Rajendra Petkar – Chief Technology Officer, Tata Motors and Mr. Shailesh Chandra, President- Electric Mobility Business & Corporate Strategy at the 89th Geneva International Motor Show 2019, today. Fulfilling its promise of bringing to life concepts showed in 2018, Tata Motors proudly presented four Global Premiers and one European Premier at this prestigious International Motor Show. Defining a historical moment for Tata Motors, in its 21st year at the 89th Geneva International Motor Show (GIMS), the Company has fulfilled its promise by bringing to life, concepts showcased in 2018. Moreover, the Company wooed the Motor Show visitors in a dramatic unveil sequence as it revealed its next generation passenger vehicles – four Global premiers and one European premier. Tata Motors displayed the BUZZARD SPORT SUV – Geneva Edition (launched in January 2019 as the Harrier in India), to honour its commitment made last year when it unveiled the H5X Concept. The Company has stayed true to its promise and has showcased this truly global SUV, turning concept into reality. The BUZZARD SPORT – Geneva Edition offers a perfect combination of design and excellence. It is engineered on the new-generation Optimal Modular Efficient Global Advanced (OMEGA) Architecture, developed in collaboration with Jaguar Land Rover. Derived from Land Rover’s legendary D8 Platform and optimised for Indian conditions, the BUZZARD SPORT- Geneva Edition offers exemplary driving dynamics on varied terrains, absolute safety and a refined in-cabin experience. The BUZZARD SPORT Geneva Edition comes packed with a host of exterior design changes specially made for the global markets. The ALTROZ and the ALTROZ EV – the twin premium urban cars with different hearts, have been designed and developed on the all-new Agile Light Flexible Advanced (ALFA) Architecture; a futuristic, modular, versatile architecture depicting a radical new approach to design. With lightweight, modular and flexible characteristics, it allows the manufacturing of multiple body styles with a choice of powertrains including gasoline, diesel or full electric to meet the constantly evolving aspirations of the customers. This architecture also has the ability to evolve into a range of modern, exciting vehicles in a short development cycle. Flexible solutions in the Architecture also make it capable of handling connected/ hybrid car offerings in future. The ALTROZ is the second product designed under IMPACT 2.0 Design language and aims at reinventing the urban car design with greater emphasis on bringing connectivity and everyday mobility together. It is an amalgamation of revolutionary design, advanced technology, class leading connectivity and thrilling performance. With the ALTROZ, Tata Motors will enter the premium hatchback segment in India, in mid-2019. Adding to the stunning lineup, Tata Motors unveiled its flagship SUV based on the OMEGA Architecture, the BUZZARD – Geneva Edition. A global SUV, which is the true personification of luxury and power, the BUZZARD – Geneva Edition, has an aura that captivates. With its majestic appearance and unmatched performance, the BUZZARD – Geneva Edition, is designed for those who inspire and lead. The BUZZARD – Geneva Edition is a masterpiece, carefully crafted with exciting proportions, expressive surfaces, futuristic safety features and extraordinary attention-to-detail, the BUZZARD – Geneva Edition is designed for the discerning, offers unparalleled comfort to the family. With the perfect balance of exclusivity and functionality, the the BUZZARD – Geneva Edition is ready to cast its spell on those who focus on the finer things in life. 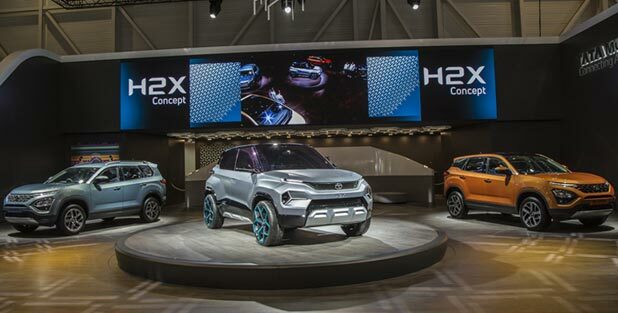 The showstopper of the event and the star attraction was the H2X Concept, a sub-compact SUV. Capturing the essence of the active customer, the H2X Concept is dynamic, expressive and versatile, providing exemplary performance, future ready connectivity and outstanding interior roominess. Based on the new ALFA Architecture, this concept shows the future design direction of Tata Motors under the IMPACT 2.0 design. It takes successful design cues from the H5X Concept and condenses them into a stunning package with intelligently designed space. Tata Motors is all geared with the Turnaround 2.0 strategy already into play. With a new dual-architecture strategy in place, the Company is all set to unleash the full potential of its future passenger cars. *The BUZZARD is the product names coined for GIMS 2019 only. The christening of the production version of the vehicle in India will be announced closer to the commercial launch.